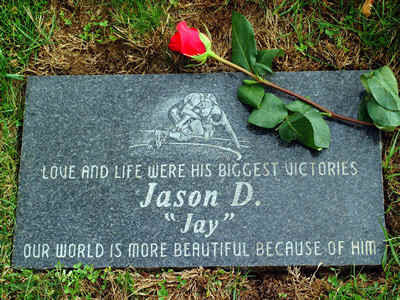 There are many different styles of granite monuments and memorials. It is helpful to know the correct industry terminology to describe them when ordering or discussing options with the cemetery. It is also very important that you check with the cemetery where the marker will be installed. All cemeteries have rules and regulations that specify the size and style of markers that are allowed on a particular lot. Some cemeteries even specify the color of granite and the type of design allowed. 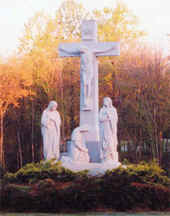 For example, most Catholic cemeteries require some sort of religious emblem on the marker, such as a Cross. Marble has been used for centuries and is well known for its traditional beauty. White is the most popular color used in monuments and typically has various degrees of gray "veining" adding to its attractiveness. Bronze is called the "eternal metal" and is used for flat markers, statuary, and as ornamentation in combination with granite and marble. All are a minimum of 4" thick. Most common sizes are 16"x8" and 24"x12"
Slight 2" bevel slant from back to front of marker. May be used for individual or companion also. Usually 6" or 8" thick. Upright slant shape. The thickness identified during ordering is the thickness of the bottom. The top is usually 2" thick. Flat, oval, or serpentine top. This will be explained a bit later. Standard 2" - 4” front nosing. May be used for individual or companion. May be used without base. The top tablet portion is known as a "die." Most are usually 8" thick. Designed to stand straight up perpendicular to level ground. Larger size allows for more personalized expression and room for engraving. Floral & Scenic designs and the family name are popular additions to the front. Becoming very popular for both a memorial and as a cremation memorial, if allowed. Engraving can be done on edges, or on top of bench.